The NanoBusiness Alliance hosted our 9th Annual NanoBusiness Conference on September 27-28th in Chicago, with two days of individual presentations and speaker panels plus a company showcase. Many participants stayed an additional day to network with colleagues from the Water Innovations Alliance, which co-located with the NbA for the second year. Our conference began Monday morning September 27th with a power-packed session led off by former NbA Executive Director Sean Murdock, now CEO of Nanosonix. Sean gave his perspective on the effects of the recession on the innovation ecosystem and urged the members of our community to think about how their personal actions, as innovators and investors, can make a difference in the ultimate success of nanotechnology. He gave some historical perspective on public and private investments in nanotechnology, reminding the audience that we are still working in a very young field. He noted that this fact makes us especially vulnerable to the effects of the broad decrease in venture capital investments and other private financing which began two years ago. Public funds and public-private partnerships are thus more important than ever. Murdock said that an increase in the overall scale of investment in commercialization activities from U.S. source is essential in order to effectively capture the value of the extensive taxpayer investment in nanotechnology. The second presenter in the opening session was Nanosphere President and CEO William Moffitt. Bill noted we were meeting amidst the very active and positive Chicago nanotech community. Nanosphere and their neighbors are leading innovators in applying nanotechnology to develop new medical diagnostics and therapeutics. He also noted that the transition from lab science to commercial technology often takes decades, but showed that Nanosphere is well on the way to commercializing the conjugated gold nanoparticles that Chad Mirkin of Northwestern University first developed in 1997. Nanosphere’s Verigene system based on this technology is FDA approved for several in vitro tests, and the company continues to expand that product line. Offering rapid, highly selective, amplification-free testing of genetic materials, Moffitt believes this technology will eventually replace the two major biomedical breakthroughs of the last 40 years – immunoassays and PCR-based genetic testing. Nanosphere’s test for troponin, for example – a protein complex released into the blood stream during a heart attack – is far more sensitive than the conventional assays commonly used in hospital emergency rooms. These kinds of tests will first be used for medical conditions that are both widespread and expensive to treat. As their cost comes down into the $10 range, however, many additional indications will become attractive. Intel’s Government Programs Manager, George Thompson, followed with his own take on where nanotechnology fits in the story of American innovation. Thompson, who manages Government Programs for the semiconductor manufacturer, emphasized that innovation (as opposed to invention) takes place in a context that depends heavily on culture. While the U.S. reputation for innovation is rightfully strong, he noted that our science and technology culture has changed significantly in the days since, for example, the semiconductor revolution began. We are still the innovation leaders by most measures, but our lead is disappearing. When the transistor was first developed, Bell Labs (as the research arm of a regulated monopoly) functioned almost as a federal technology R&D center. Department of Defense investments and the in-house relationship with Western Electric brought the transistor through the valley of death. Thompson noted that his industry’s ability to continue innovating rapidly – following what we all know is Moore’s Law – is based on an unusual property of transistors: they get better as they get smaller. He urged us to think about where else nanotechnology may enable synergies that allow for multiple generations of product improvements. George gave several examples illustrating the previous speakers’ remarks that we should be patient given the typical 15-year-plus timescale for technology development and acceptance, and then refined that view with two observations: 1) our accomplishments to date are by no means insubstantial, and 2) long-term development calls for a strategic, long-term view. In the United States it is rare to find that view outside of government, but public-private partnerships offer industry a good mechanism for participating in extended development. Right now, we are net exporters in only a few industries: raw materials, airplanes, entertainment, and services. It will take planning to change this, especially given the coordinated efforts taking place in other countries. Illinois Congressman Daniel Lipinski capped off our opening session with remarks about the economy, the political climate in Washington, and how nanotechnology plays into his hopes for his own district. As most of our readers know, Congressman Lipinski is a member of the House Science Committee and a long-time supporter of the nanotechnology community, and was an important force in moving reauthorization of the National Nanotechnology Initiative through the House. Unfortunately, he told us, we’re unlikely to see imminent action from the Senate on NNI reauthorization or the Small Business Innovation programs (SBIR & STTR). In fact, some of his congressional colleagues are opposed to any Federal funding for commercialization activities. But he promised to continue to push for these bills and other mechanisms to help turn the last decade’s $12B Federal investment in nanotechnology into successful companies providing new American jobs. As the representative of an urban and middle class suburban district with a long manufacturing tradition, Congressman Lipinski is counting on us to help reinvigorate his local economy with products built here, not in China or Japan. You’ll find the full text of Congressman Lipinski’s address online at http://bit.ly/lskiNBA2010. Following the plenary session, attendees had two tracks from which to choose. Dave Arthur of SouthWest Nanotechnologies and Michael Lefenfeld of SiGNa Technologies led off the Innovations in Nanotechnology track with updates on their company’s stories, after which Glenn Killoren (Barnes & Thornburg) led a panel entitled “Recent Trends in Buying & Selling Your Nanotech Company”. Mike Pellegrino (Pellegrino & Associates), Curt W. Hidde (Barnes & Thornburg), and Thomas Churchwell (Midwest Venture Partners LLC) rounded out the discussion. At our EH&S track, Lynn Bergeson, Partner, Bergeson & Campbell, moderated a panel which reviewed regulatory and policy issues nanotechnology companies face. Rosalind Volpe of the Silver Nanotechnology Working Group updated NbA members on the progress her group has made in working with the EPA to clarify the status of nanosilver under the Federal Insecticide, Fungicide and Rodenticide Act since she first addressed us during last March’s Alliance meeting in Washington, DC. Evonik’s Shaun Clancy, who has been an active participant in ISO and OECD nanotechnology groups, updated us on international standards activities related to nanomaterials safety, as well as work among U.S. chemical trade associations. Kenneth Moss from the EPA’s Office of Pollution Prevention and Toxics discussed the agency’s current thinking regarding nanomaterials under the Toxic Substances Control Act, noting many similarities to the approach the agency took with biotechnology. Nina Horne, a City Commissioner in Oakland, CA and a delegate to the OECD’s Working Party on Manufactured Nanomaterials, has been closely monitoring the California Department of Toxic Substances Control work on nanotechnology under its green chemistry initiative. She urged all nanomaterials manufacturers to look carefully at the California calls for data and proposed requirements, which could be much more prescriptive than what other states and the Federal EPA are doing. Philip Lippel, a member of our advisory board and a consultant on nanoscience and emerging technologies, summed up the morning EHS session with comments on how these developing issues fit into the overall picture of regulation and public acceptance for nanomaterials and nanotechnology more generally. The group reconvened later in the day for a freewheeling discussion with interested attendees regarding the developing regulatory landscape and opportunities for NanoBusiness Alliance members to work together in this area. Lynn Bergeson invited all interested parties to contact the EHS committee members to discuss how the NbA can promote product safety and ensure that companies have clear paths for complying with applicable regulations. 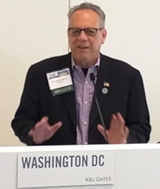 Two distinguished speakers addressed the conference during lunch – Clayton Teague, Director of the National Nanotechnology Coordination Office, and George Scalise, President of the Semiconductor Industry Association. Dr. Teague spoke of the high priority in the Office of Science and Technology Policy for research related to climate change and clean, sustainable energy. He urged everyone to look at Presidential Science Advisor John Holdren’s recent Kavli Prize Symposium speech on the subject, available at http://bit.ly/JHoldren_Kavli. Then he thanked NbA members for their participation in the strategic plan review process for the National Nanotechnology Initiative and said the updated strategic plan is on target for release in late December. There will be no substantive changes to the overall NNI goals, but the agencies are working hard to include much more specific objectives and milestones pursuant to those goals. Mr. Scalise followed with a presentation that emphasized the importance of sustained R&D to the semiconductor industry as it seeks a new nanoscale switch to replace the CMOS transistor. As detailed in the International Technology Roadmap for Semiconductors, CMOS will reach its ultimate size and performance limits in just a few more generations, sometime around 2015. The Nanoelectronics Research Initiative, in which SIA partners with NSF and NIST, is intended to ensure that the U.S. maintains its leadership as the semiconductor industry discovers and develops new technologies to extend Moore’s Law beyond the CMOS era. As such, it is perhaps the premiere example of the kind of public-private partnership so many of our speakers touted as essential to the successful commercialization of America’s nanotechnology know-how. After lunch, the EHS track continued with an extension of the morning panel discussion, followed by Don Ewert’s (OSO BioPharmaceuticals) presentation on how nanoEHS issues are handled in an industry with well-established industrial toxicology practices. Meanwhile the commercialization track continued, starting with an Intellectual Property panel moderated by Dr. J. Steven Rutt (Foley & Lardner LLP) and featuring Neil Kane (Advanced Diamond Technologies), Stephen G. Wasko (Wasko Associates), Sven Riethmueller (Foley & Lardner LLP), Dr. Jeffrey R. Lomprey (Foley & Lardner LLP) and Mark Kaczor (University of Illinois at Urbana-Champaign). They discussed changes in patent law and policy that affect nanotechnology along with other emerging technologies. They noted a wide variation in the sophistication among university licensing offices (which are so often involved with nanotech startups), noting that some give broader licenses than they should to companies with the ability to commercialize only in limited areas. We are beginning to see government march-in rights asserted in some of these cases, as allowed under Bayh-Dole to ensure that government-funded research is widely commercialized. Doug Jamison and Alexei A. Andreev, both of Harris & Harris, followed with the first of several discussions of the venture capital climate. They shared their perspectives on ten years of nanotechnology investing, including H&H’s investments in 31 nanotech or microsystems companies. Alexei noted that people tend to overestimate the short-term impacts of a new technology and underestimate its long-term impacts. H&H itself was guilty of this, he said, in terms of underestimating the necessary capital investments and development timescales. On the other hand, they are seeing a higher percentage of companies survive and slowly build revenues than they originally expected. Harris & Harris feels that small VC firms, and a new breed of serial investors he calls superangels, are carving out a distinct role from larger VC firms. Superangels are particularly well suited for Web 2.0 companies, for example, where there is no visibility into the end market but one can quickly and cheaply build a first product to assess it. Large firms are drawn to industries like biotech, where the potential market and costs of competing technologies are easier to predict but the development risks are very high. H&H continues to feel that nanotechnology is a good fit with their middle ground investment strategy, which is to bet not just on cool technologies but on companies with well-defined products and identified niche entries to the market. Doug expanded on these ideas in the penultimate plenary session of the day, giving a detailed description of Harris & Harris’ portfolio of companies in cleantech, electronics, healthcare, and other industries. He divides these investments into three development stages, and noted that interested Alliance members can easily track their progress through these stages via the company’s 10K filings. He concluded by saying it is unclear how the VC community will develop in the next few years. The well-known paucity of early stage deals recently may be partially alleviated by the rise of superangels, for example, but so far they have operated almost exclusively in the internet arena, plus a few cleantech deals. Lux Research’s Jurron Bradley closed out the first day’s talks with a summary of Lux’s onboard intelligence regarding the nanotechnology community. He noted that government and corporate sponsorship for nanotechnology R&D each amounted to about $8.5B worldwide in 2009, with important U.S. and non-U.S. investments in both categories. Approximately $500M was added to USG funding through the American Reinvestment and Recovery Act. On the VC side, 6 of the top ten deals were in healthcare, with energy and environmental technologies also remaining strong despite the overall 42% decrease in VC funding vs. 2008. Nano companies received VC funding for improved batteries and for filtration products (both water and air). Lux sees the VC pie as stable or shrinking slightly in the next two to three years. Lux maps nano R&D on a two-dimensional Innovation Grid, with Business Execution and Technical Value as the axes. When they apply this methodology on a country-by-country basis, the U.S. remains at the top in technical value but is in the middle of the pack on business activity/execution, crossing over into what they call the ivory tower quadrant. Japan and Germany, in contrast, have high scores on both axes, while Singapore’s targeted electronics R&D makes them a good example of a niche player with excellent execution in limited fields. One area where Russia excels is in workforce training, but they do a poor job of utilizing their highly educated workers. In contrast, the U.S. falls short of its peers in producing degreed scientists and engineers, a weakness which must be addressed if we are to move squarely into the dominant sector of the Lux Innovation Grid. On day two of the conference, the plenary sessions were shared with the Water Innovations Alliance. The morning session gave NbA members a chance to hear several big players in the water industry talk about how their companies innovate, with presentations from Don Thompson, President of the Oil Sands Developers Group, representing companies active in the Athabasca oil sands region of Alberta, Canada; William F. Wescott Ph.D., VP for Innovation-Americas at French water giant Veolia Environnement; and Mark LeChevallier, PhD, Director of Innovation & Environmental Stewardship for American Water, the largest investor-owned water and wastewater utility company in the United States. After splitting off from our water colleagues, we heard from Jim Hussey, CEO of one of the Chicago area’s leading nanotech companies, NanoInk. Jim described the potential for using nanotechnology-based testing to develop test data as input to the regulatory process for nanomaterials. Jim emphasized that alternative test methods could reduce the time and cost of testing while reducing the reliance on animal-based methods. He called for support for a correlative testing program which would validate these new testing methods. The morning session concluded with an update on the regulatory environment from Thompson and Hine lawyers Fern O’Brian and Thomas Feher. They reviewed the EPA’s methodology for addressing nanomaterials under various sections of the TSCA and FIFRA laws, including possible effects of proposed changes to TSCA and the evolving regulation of cosmetics under current FDA authorities. They noted that the TSCA reform bill introduced in the House of Representatives shifts the burden of proving safety to the manufacturer, for example by requiring them to show that aggregate and cumulative exposure to a substance or mixture results in no harm. Meanwhile there is an evolving body of sometimes conflicting scientific and medical research regarding the safety of nanotechnology, and a tendency on the part of the public to lump all nano together in this respect. These all add up to a legal environment in which companies must consider the potential for design defect claims, latent undetected exposure, and complex causation scenarios leading to highly individualized case-by-case litigation. A company can limit its risk by assessing the safety and environmental impacts of its products early on, keeping abreast of evolving science and medical knowledge, tracking and complying with evolving standards and practices, and developing strong internal policies and procedures regarding EHS. Furthermore, they should monitor post-sale product complaints and adverse event reports and respond to them appropriately, remembering that regulation alone does not eliminate potential liability – a company’s conduct must be reasonable in light of all circumstances. Tuesday’s luncheon keynote brought us back together with the water group to hear Deputy Assistant EPA Administrator Michael Shapiro review the condition of our surface and drinking waters as we approach the 40th anniversary of the Clean Water Act. He reminded us that the CWA and the Safe Drinking Water Act, enacted a few years later, had been instrumental in bringing major pollution sources under control and making secondary treatment of wastewater nearly universal, but noted that we add more waterways to the impaired list each year than we remediate. Many native fresh water species are in danger of extinction, and pollutants such as hormone disruptors are widely detected yet poorly understood. As our population increases and land use changes, we are in danger of losing many of the gains of the last 4 decades. The resolution of this dilemma will require new legal approaches as well as new technology for real-time monitoring and for remediation. The EPA is now taking public comment on how to approach new contaminants threatening our drinking water. Their actions to date have more or less been on an individual pollutant basis, but with a growing backlog they are now considering efforts to group substances either by chemical and biological characteristics or by treatability. After lunch we again had two nano tracks, the first focused on nanomedicine and the second on transitioning from R&D to commercial production. Mostafa Analoui, Head of Healthcare and Lifesciences for Livingston Securities, led the nanomedicine track. Dr. Analoui noted that the economic turndown had broadened the valley of death, but pointed to the recently announced $2.9B acquisition of Abraxis Bioscience by Celgene as a milestone for first-generation nanopharmaceuticals. Panelist Piotr Grodzinski, the director of the National Cancer Institute’s Alliance for Nanotechnology in Cancer, described the Alliance’s work supporting academic and industry researchers, including the innovative collaboration with NIST and the FDA to help them transition therapeutics into clinical settings via the Nanotechnology Characterization Laboratory. He updated us on the progress of several liposomal or polymeric nanopharmaceuticals through the clinical trial process, and noted the important opportunity to utilize nanoscale delivery mechanisms for difficult-to-deliver molecules such as siRNAs. Sarah Lee of Baxter Healthcare and Anil Diwan of NanoViricides then each described their company’s nanotechnologies. Baxter is working on reformulations of several compounds as nanoscale solids, coatings, or suspensions; Dr. Lee used their work on improved delivery of paclitaxel to ovarian tumors as a case study. NanoViricides has developed a platform technology which mimics cells from the virus’s perspective. Viruses try to attack the company’s nanomicelles, but they unfold, encapsulating and deactivating the virus. The company has the potential to develop specific nanoviricides targeting Dengue, Marburg, Ebola, HIV, or many other viruses and is also developing a technology which would allow field development of a product for rapid response to novel viruses. The company has recently raised $12M which will enable expansion of their testing program. Ioannis Tomazos, CEO of Biorasis was the next speaker. Dr. Tomazos expects the company’s implanted sensors, which use nanogels for biocompatibility and communicate with the external world via wireless transducers, to find their first successes in animal use, for accelerated drug development. Once they have developed and validated accuracy standards for human use, Biorasis foresees application as a continuous glucose monitor. The final three nanomedicine panelists were Winton Gibbons, Sr. Vice President of Business Development for Nanosphere; Percy Van Crocker, Jr, Vice President, Commercial Development, AuraSense, LLC; and Dr. Rangaramanujam M. Kannan, Professor of Chemical Engineering and Materials Science, and Biomedical Engineering, Wayne State University. Gibbons elaborated on Nanosphere’s nucleic acid detection and protein diagnostics technologies, previously discussed on Monday by Bill Moffitt. Mr. Crocker discussed AuraSense’s products, also originating from the conjugated gold nanoparticle technology developed at Northwestern University, for therapeutic use (gene regulation, synthetic HDL) and for assaying genetic material within cells. Professor Kannan discussed his group’s work at Wayne State using nanodevices based on dendritic polymers conjugated to drugs and imaging agents. Meanwhile, two successive panels discussed issues regarding how to cross the commercialization gap. Skip Rung of the Oregon Nano and Microelectronics Institute led the first panel, in which several Oregon companies joined ONAMI Gap Fund Manager, Jay Lindquist, to discuss their state’s innovation ecosystem. Panelists included Walt Weyler of Crystal Clear Technologies; Mark Owen of Puralytics, and Mike Brown of Zaps Technologies. The second panel, moderated by Todd G. Vare (Barnes & Thornburg LLP) and featuring Jon Belkowitz (Intelligent Concrete, LLC) and Craig Bandes, (Pixelligent Technologies) emphasized the value of building strong relationships with government entities willing and able to be first customers. Our conference concluded with two very different but equally inspiring scheduled talks by superstars of the water community, plus a bonus address by a distinguished visitor. Professor Mark Shannon of the University of Illinois talked about the fomenting revolution in water, discussing a myriad of technical solutions to the wide variety of supply and treatment issues around the world. NbA members familiar with Mark’s work won’t be surprised to hear that many of these solutions involve nanotechnology. Mark was followed by a special guest who became available to speak after our programs went to press, Vepo Ragayer of the International Finance Corporation. As a private finance group operating within the World Bank Group, the IFC aggressively funds programs in the developing world that are focused on climate change and environmental sustainability. They will provide about $20B in debt and equity financing during FY2010, of which about $1B will go to water infrastructure projects that will impact an estimated 35 million people. They hope to triple the size of the water program in the next three years. The conference closed with an inspiring presentation by Explorer & Aquatic Environmentalist, Fabien Cousteau, who is carrying on in his grandfather’s tradition to make the public aware of the fragile beauty of oceans. I would like to thank our attendees, speakers and sponsors who contributed to our success in Chicago. We have just finished our 9th Annual NanoBusiness Alliance Conference http://www.nanobusiness2010.com/ in Chicago, IL. On Monday afternoon we had the opportunity to hear a Keynote Speech delivered by Doug Jamison http://www.tinytechvc.com/team.cfm, CEO of Harris & Harris http://www.tinytechvc.com/index.cfm (TINY). Doug’s 10 year analysis of the Nanotechnology market was relevant and pragmatic. Doug Jamison, Chairman of the Board, Chief Executive Officer and Managing Director, Harris & Harris Group, Inc. Mr. Jamison has served as Chairman and Chief Executive Officer since January 2009; as President and Chief Operating Officer from January 2005 to December 2008; as Treasurer from March 2005 to May 2008; as a Managing Director since January 2004; as Chief Financial Officer from January 2005 to December 2007; and as Vice President from September 2002 to December 2004. He has been a member of the Board of Directors since May 2007. Since January 2009, he has served as Chairman and Chief Executive Officer of Harris & Harris Enterprises, Inc., a wholly owned subsidiary of the Company, since 2005, he has served as a Director; and from January 2005 to December 2008 he served as President. From 1998 to 2002, Mr. Jamison worked as a Senior Technology Manager at the University of Utah Technology Transfer Office, where he managed intellectual property for the University of Utah. This included assessing technologies in both the biological sciences and the physical sciences, working with patent attorneys to develop patent protection, and developing and marketing these technologies with industry. He is a Co-Editor-in-Chief, Journal of Nanotechnology Law & Business and Co-Chair of the Advisory Board, Converging Technology Bar Association and a member of the University of Pennsylvania Nano-Bio Interface Ethics Advisory Board. He was graduated from Dartmouth College (B.A.) and the University of Utah (M.S.). SW: We are delighted to be able to speak with you today, Doug, and appreciate your time. There is a lot to discuss. Let’s start off talking about the structural changes witnessed in the public capital markets over the past decade and what that means for companies bringing nano-enabled products to market. What are the big changes we’ve seen and how have they impacted the venture capital business and the nano community in particular? DJ: There have been multiple structural changes in the public markets over the past decade, but the ones we are most concerned about are the changes that have occurred in the market for companies with less than $500 million market capitalizations. David Weild and Edward Kim recently detailed some of these structural changes in an article titled, “Market structure is causing the IPO crisis – and more.” The rise of online brokerage has destroyed the incentive for brokers to discover small capitalization companies and to help these companies communicate their stories to the public markets. Decimal pricing for stocks and options, while making the greater market more liquid has eliminated the incentive for market makers to put their capital at risk, creating less liquidity for the smallest public companies. Regulation Fair Disclosure devalued stock research. Capital markets infrastructure for the smallest public companies has continued to erode. Initial Public Offerings (IPOs) that raise below $50 million have declined precipitously after 2000. IPO candidates now need to be larger and more mature before accessing the public markets. The result of these structural changes has been a steep decline in publicly listed companies on U.S. based exchanges (NYSE, AMEX and Nasdaq). The authors above trace this decline in listings to 22 million potential jobs that have been lost across the economy. For the United States, the problem is compounded by the fact that these changes are happening in an environment in which other countries’ exchanges have been increasing the number of listed companies and the number of public companies listing outside the United States is increasing. The impact for the U.S. venture capital community is that venture capital as an asset class is now experiencing negative returns. This will result in less capital flowing to venture capital as an asset class which may translate to less capital being made available for small, innovative, high growth companies. Nanotechnology companies, which are naturally capital intensive, will need more capital and need to be more mature than was historically the case before the potential for an exit opportunity emerges. These companies could be required to identify alternative sources of capital than the venture capital community. That said, there are a number of nanotechnology companies that have successfully raised significant amounts of capital which says a lot about the quality of these nanotechnology companies. SW: Harris and Harris Group (H&H) continues to be laser-focused on nanotechnology despite the lack of activity in the IPO markets to date. Has there been a drop off in the number of U.S.-based venture firms engaged in nanotech financing activities due to these structural changes? DJ: From the beginning, there hasn’t been nanotechnology-focused venture financing. Venture capitalists have remained focused on industry verticals and end markets applications. This has been beneficial for us, as we have been able to become a leader investing in nanotechnology while being able to partner with some of the best venture firms in their respective industry of expertise. Additionally, in the areas we invest in, such as energy, healthcare, electronics and semiconductors many exciting breakthroughs occur at the nanoscale. As an early stage venture investor, that has led to significant interest in some of the early stage companies we have financed. For instance, in our cleantech portfolio, we are the first institutional investor or a member of the first group of institutional investors in eight of our 12 investments, many of which have raised additional capital from top-tier institutional investors. That said, the active venture capital community is getting smaller, and fewer venture capital firms are making new investments in all markets, not just those enabled by nanotechnology. SW: You mentioned in a previous conversation that we are seeing a bifurcation in the venture capital sector. What is the significance of this and what are the implications for companies for the nanotech community? DJ: We are seeing venture capital firms with under $200 million in assets under management becoming more focused on investment opportunities that will require less than $15-30 million in invested capital over their lifetime. This means that these firms may invest less with the larger venture firms and partner with other smaller firms that have the same venture economics. Larger firms with capital to invest are currently in a better position, because these firms can write the large checks required for companies that need to be more mature before reaching an exit opportunity. I think this bifurcation is positive as it is forcing venture funds to find a business model that works for their respective asset sizes. For the nanotechnology community, this bifurcation means that entrepreneurs need to be knowledgeable of their investors’ assets under management and how much available capital these investors have, what we call “dry powder.” This will dictate the strategy of the investor and the direction the investors will force the company to take. Entrepreneurs will need to make sure their vision of the company, their investment requirements and the time to exit are compatible with their investors. Ultimately, because increases in valuations are more difficult to achieve even for companies that are executing flawlessly against their business plan, entrepreneurs will also need to find ways to grow their companies with greater capital efficiency. SW: Despite the structural changes and the evaporation of all the nano hype on Wall Street we saw earlier in the previous decade, one gets the sense that nano as an enabling technology is ready for prime time. What’s your assessment? DJ: By this point in the interview, the reader is probably horrified by the future prospects of venture capital investing. However, even in a very difficult venture investing climate and in a very difficult economy over the past two years, companies enabled by nanotechnology have been maturing. I will focus on our portfolio because I know it well, but the maturing of nanotechnology-enabled companies is occurring across the board. In our portfolio, we classify our investments into three maturity baskets early stage/technology risk, mid stage/market risk and late stage/expansion risk. We have eight companies in the latter basket. Of these, Solazyme, Xradia, NeoPhotonics, Bridgelux, Molecular Imprints and Metabolon all had record revenue years in both 2008 and 2009. Five of these companies could each generate more than $20 million in revenue in 2010. NeoPhotonics recently reported record second quarter 2010 revenue of over $45 million, and the company was over $2.5 million net income positive in the second quarter alone. In this late stage/expansion risk basket, we also have BioVex, which is in Phase III clinical trials in malignant melanoma. Even in our mid-stage/market risk basket, these nanotechnology-enabled companies are advancing rapidly. Nanosys recently signed two partnerships, one with LG Innotek and one with Samsung Electronics, both of which will lead to significant growth in revenue in 2011. Innovalight has signed agreements with JA Solar and Yingli Green that will lead to growth in revenue in 2011. Mersana Therapeutics signed a $334 million partnership with Teva Pharmaceuticals for one of its therapeutic programs. Over two thirds of our nanotechnology portfolio has strategic partners and investors, many of which could become potential acquirers of these companies. Eight years into our focus on nanotechnology, I would say that maturity, defined by product revenue or partnering activity, and not just by capital raised, is in line with our expectations. The number of companies in our portfolio that have a chance at success exceeds our expectations currently. This indicates to us that nanotechnology enables real innovation in the markets where it is focused, and that the impact on these markets is occurring now rather than multiple years from now. The poor economy and the resulting investment climate probably have been helpful in allowing us to discover the companies that won’t succeed earlier, thus permitting us to use our capital for the potential winners. SW: There is some fascinating research and development going on within the H&H nanotech portfolio. Can you share some of the highlights with us? DJ: Many of our more mature companies have been quite public with announcements over the past six months. You can access their announcements and view their progress on our web site at http://www.hhvc.com/releases.cfm?Year=&ReleasesType=&PageNum=1. We have one young company that is beginning to gain traction in the 3-D cinema market, which is an area that has gained a lot of press recently. Laser Light Engines (LLE) develops solid state light sources for digital cinema and large venue projection display. The founding technology is based on two important nanotechnology-enabled innovations: 1) the ability to use the combination of inexpensive laser materials and amplification to reach high brightness levels and 2) the ability to convert infrared light into red, green and blue light, separately. The company will manufacture a light source module that can be incorporated in a standard digital cinema projector used by theaters for 2D and 3D movies. LLE recently announced an agreement with IMAX Corporation whereby LLE will develop a custom version of its laser light technology for use in IMAX digital projection systems. SW: From your vantage point, what key industries in the U.S. are intensively engaged in nanotechnology research and development? DJ: As I mentioned previously, because many of the advances in science and technology are occurring on the nanoscale, many industries are actively involved with nanotechnology research and development (R&D). In healthcare, the areas of drug delivery, vaccines, personalized medicine and molecular diagnostics are actively engaged in nanotechnology R&D. The semiconductor and electronics industries have been actively engaged in this type of R&D for the past decade. Specifically, next generation chip technology, printable electronics, new transparent conductors and thermal management technologies are developing rapidly. In cleantech, the areas of solar, batteries, power management, biofuels and LEDs are all very active. SW: H&H currently has 31 private companies in its portfolio. Do you expect any of them to come public within the next 6-12 months and if so, which ones? DJ: I cannot provide you with many of the names, but currently, NeoPhotonics has filed an S-1 for an IPO. We have two other companies that have engaged bankers for potential sales of their company over the coming 12 months. If the investment climate and the economy are able to stabilize, we believe we may have at least two or three more opportunities for exit events over the coming 18 months. That said, there can be no assurance that these events will occur and a variety of factors, including stock market and general business conditions, could lead any or all of these events to be postponed or not to occur at all. SW: What is the environment for mergers and acquisitions in nanotechnology today? Do you expect to see more nanotech M&A activity in the future? DJ: We expect merger and acquisition (M&A) activity to increase over the next few years. Companies have record levels of cash on their balance sheets. These same companies have been forced by the economy and their shareholders to reduce spending and cut costs. In an environment of very slow economic growth over the coming years, these companies will still be asked to deliver profit growth. Now that expenses have been cut and pipelines depleted, these companies will need to turn to innovative growth companies. In the area of energy, healthcare, electronics and semiconductors, we believe that rapidly maturing nanotechnolgy enabled companies, some of which are even generating positive cash flows now, are beginning to be viewed as likely candidates for M&A activity. SW: You recently wrote a letter to your shareholders that marks a change in strategy at H&H. Tell us about the shift and why you are excited about it. DJ: We believe some of the structural changes in the market place for both private and public investing have created opportunities for us to expand our strategy. We will remain focused on providing venture capital for nanotechnology enabled companies, but in addition to private venture capital investments, we will also make public venture capital investments and engage in providing debt to nanotechnology enabled companies. Our public venture capital investments will be focused on the smallest market capitalization, typically companies below $100 million with a sweet-spot in the $50 million market capitalization range. Currently, when compared to equivalent private companies, we believe these public companies are undervalued. We also believe these companies provide us with an opportunity to realize more frequent returns as we believe our time from investment to exit will be 12-24 months rather than 7-10 years for some of our private investments. We believe these companies have the potential to offer venture capital returns in this shorter period of time. Additionally, credit remains extremely expensive or unavailable for even the strongest small private companies. We have an opportunity to secure favorable terms on debt we provide for companies we know well or work with through our venture investing activities. In addition to fees and monthly principle and interest payments, we may receive warrants in these investments. Many nanotechnology enabled companies are currently producing revenue and some have positive net income. We believe providing venture debt permits us to generate near-term cash flow with a defined period for return on our investment. SW: When you make an investment in publicly traded nano cap companies, what are some of the characteristics you look for in the company? Would you ever consider taking them private at some point? DJ: In publicly traded nano capitalization companies we look for the following: companies bringing exciting nanotechnology enabled products to market; public companies that are undervalued in comparison to equivalent private companies; opportunities where additional capital is the primary requirement for the company to execute on its strategy and where the company raises enough capital to remove the financing risk; companies with a defined pathway to increased trading liquidity in their stock; and companies that attract long term investors rather than quick “flipping” hedge funds. We currently don’t have plans to take companies private, but it is certainly within our mandate to do so if the right investment opportunity were to arise. SW: What has been the response of publicly traded companies you have invested in thus far? One would assume that they are delighted to have H&H on board, especially given all the experience and resources you can bring to table. DJ: The publicly traded companies we have spoken with are interested in attracting long-term, fundamental investors that understand their business. This describes us well as venture investors. Additionally, these companies appear interested in the 15,000 plus shareholders in TINY that will be introduced to their company through our investment. SW: I would imagine with 31 private investments that analysts and investors on Wall Street find it difficult to value H&H’s stock. What kinds of things do you do to help educate and enlighten analysts and investors on your business? DJ: Valuing Harris & Harris Group has always created difficulties for Wall Street. It is very difficult for investors and analysts to completely understand all 31 companies because these companies are private and may not choose to provide information on them. However in venture capital investing, historically, a small percentage of the investments create the great majority of the return for a venture capital fund. Historically, for Harris & Harris Group, less than 40 percent of our investments have created all of the returns for the company. Therefore, we think it is important for investors to focus on three areas. First, we believe investors should focus on the 4-5 companies that appear to be maturing and that offer the greatest potential return. In our public filings, we break out our investments into three baskets as defined earlier to permit investors to focus on those companies that have the best near term return potential. Second, we believe investors should focus on our pipeline of investments. Are there enough exciting opportunities moving through our pipeline to provide the next generation of returns following our first 4-5 opportunities? Third, we believe investors should focus on the markets our nanotechnology enabled companies are addressing. Are these markets the exciting markets of tomorrow where new companies will be able to extract a premium valuation? In our public filings, we also provide a series of slides that inform our investors about the existing and emerging markets our companies are addressing. SW: Turning to Washington for a moment, do you think most U.S. policymakers understand the importance of nanotechnology and its role in fostering future innovations, competitiveness and higher living standards? DJ: Currently, I think there is a dislocation in Washington. When asked about nanotechnology, I think policymakers understand that it is important for U.S. competitiveness and that it could be a great driver of future innovation and productivity for the U.S. economy. I credit the NanoBusiness Alliance and a handful of individuals and organizations for effectively communicating that message. However, I think Washington’s focus on the small businesses and the ecosystem that creates the innovations that are so important in retaining U.S. competitiveness in a more competitive global world has been lost in the government’s response to the credit crisis and the recession. This is unfortunate, because now more than ever, I believe it is these small businesses that drive innovation that offer our country’s best hope for the competitive future ahead of us. SW: You are involved in editing and publishing The Nanotechnology Law and Business Review, which we’ve always enjoyed reading. How is the publication doing these days and how do interested NanoBusiness Alliance members find out more about it? DJ: The Journal continues to provide peer reviewed articles on topics that are important to the nanotechnology community. I would recommend going to the web site for Nanotechnology Law & Business to subscribe or to access an article on line. The web site is http://www.nanolabweb.com/. SW: One last question for you today, Doug. If you were speaking to a group of entrepreneurs who wanted to venture into nanotechnology today, what are three of the most valuable business lessons you would share with them? DJ: My mentor and the founder of Harris & Harris Group, Charles Harris, has a series of Wall Street adages gathered over 42 years in business that I have found very helpful in guiding me. Four of them are as follows. First, survive to thrive – try to anticipate and prepare for the hard times as they are a normal part of the business cycle and life. Remain in the game and when conditions start to improve, you will be on the ground floor, and it is amazing how quickly you will prosper. Second, give talented, hungry young people a chance to move forward in their careers, even if others think they are not ready. Third, only enter a field in which your company can reasonably expect to become a leader. Finally, pessimists are usually right, but optimists change the world. The art of venture capital is to help the optimists while being aware of the worries of the pessimists. SW: Thanks again for your time, Doug. We really enjoyed speaking with you and wish you and your colleagues at H&H all the best in the future. You are currently browsing the Evolving Innovations weblog archives for October, 2010.